Sample shown on White Stock with Black ink and optional Black lining. $52.00 As Low As $2.08 ea. 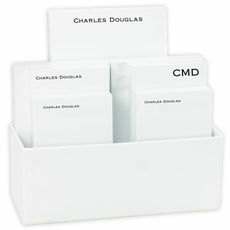 Set of foldover note cards with a stylish embossed framed border and optional inside imprint. Size is 5" x 4". Blank envelopes included. Your choice of stock. Printed in raised ink of your choice. Printed return address and envelope linings available. Upper/lowercase typestyle only as shown. Please provide all the text you want to appear. We do not automatically include any text.